This site has the link for anyone wishing to joinig a unit. Parents no longer have to contact the unit leaders direct. You have to complete the application form on line. Brownies:- The Brownies meet on Thursday evenings in the Sunday School rooms by the park gates. Cubs and Scouts:- There are no units in the village. All the surrounding villages have packs. 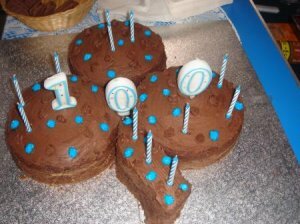 2010 was the National Brownie Centenary year. At the Annual Thinking Day Service Brown Owl made this lovely cake and the Brownies sang Happy Birthday to themselves. 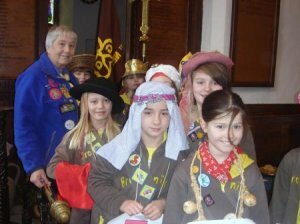 The Brownies always enjoy this service when they get an opportunity to think of the Girl Guide Movement around the world. They wear hats from different countries and welcome their friends and relations who attend the service with a sentence or so in the appropriate language. They enjoy it so much they have been heard to say they already know which Country they want to be next year. Brown Owl and some of the Brownies can be seen in the following photo.